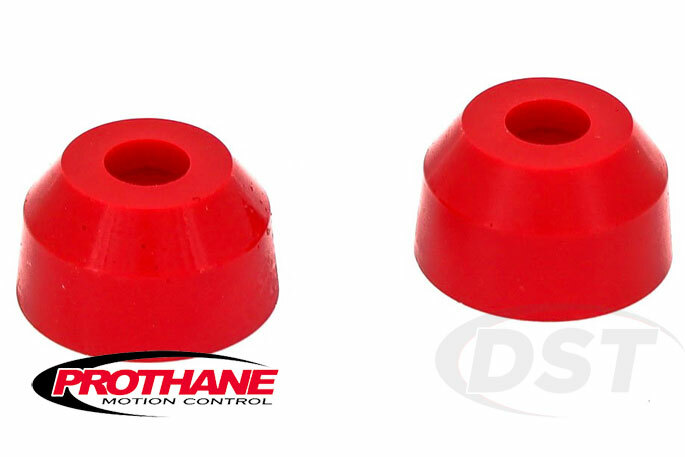 Polyurethane Tie Rod End Boots from Prothane do a better job of protecting your tie rod ends than the original rubber boots and will last the life of your vehicle. Find tie rod boots for your vehicle below. Prothane's poly dust boots provide a low-cost upgrade that could very well extend the life of your tie rod ends by keeping corrosion causing elements out. Your tie rod ends are essential for steering, so if mud, road grime, or other debris make their way into the metal-on-metal inner workings of that joint you can have big problems. The original dust boot that is responsible for keeping those contaminates out is made of rubber, which age and wear can break down till it tears or falls apart completely and leaves your rod end open to the elements. A durable and inexpensive upgrade/replacement is Prothane's polyurethane tie rod boots. Polyurethane retains it's flexibility far longer than rubber and holds up much better under hard usage, like that of a work truck or a northern daily commute that often includes slush with road salt mixed in. Made in the USA and covered by a Lifetime Warranty, Prothane's poly dust boots provide a low-cost upgrade that could very well extend the life of your tie rod ends by keeping corrosion causing elements out. * If you're unable to find a boot for your vehicle check our handy Prothane Universal Dust Boot page for instructions on measuring your tie rod ends and selecting a Prothane boot for your application or contact DST's helpful customer service folks.